After 5+ years, which started as Michael Scriven’s assistant, I’m departing from The Evaluation Center at Western Michigan University on August 31 to accommodate the major increase in my consulting around data visualization and evaluation reporting. I began the tedious effort of cleaning out my drawers and came up the ubiquitous stack of business cards I’ve accumulated over the years (why do we do that?). I saved a few because they reminded me of great graphic design principles that we should all be applying to our evaluation reporting. Strong alignment between text, headers, and graphics communicates professional competency. Work it! 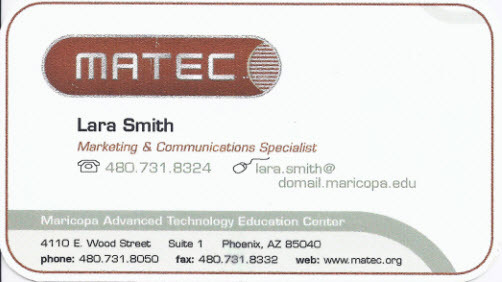 The most important thing on a business card is the name of the employee. Yet on most business cards, the employee’s name is small, put in the corner, and camouflaged by less important location information (let’s psychoanalyze what that means about employer-employee relationships). Great business cards showcase the employee’s name. Think about how this supports user cognition: If you’re anything like me, you’ve forgotten someone’s name within 10 seconds of introduction. We inevitably trade business cards before departing. I want to call this person by her name when we say goodbye, so I sneak a glance at the card. In the best case, the name leaps out and saves my day. Good design supports the needs of the end user. 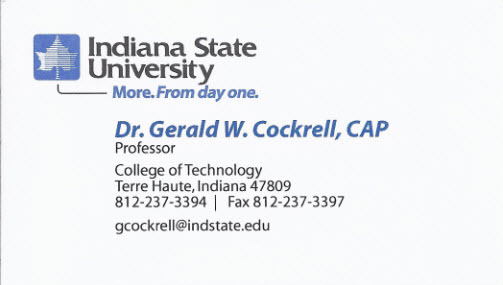 See how Gerald’s name has been visually made the most important part of the card by it’s large size, color, and italics? In the hierarchy of importance on the card, Gerald’s name is at the top and the information of lesser importance is deemphasized. 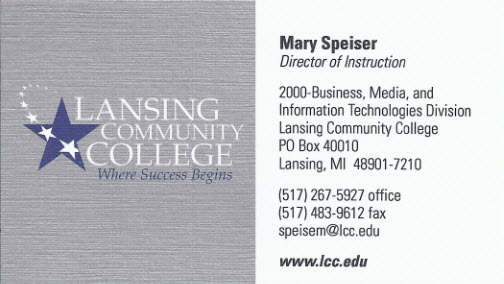 Mary’s card, way above, also achieves in establishing a hierarchy by making Mary’s name darker than the rest of the text and placed at the top of the card. 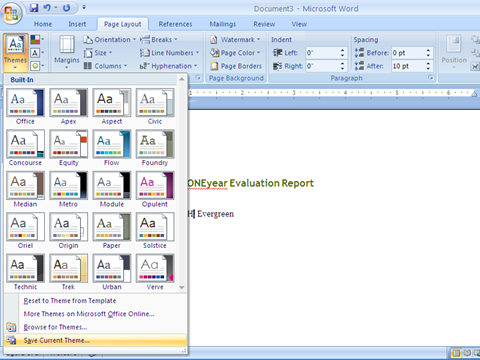 Our evaluation reports and slides should strive for the same communicative power. That which is most important should be set off in some ways, through color or placement or size or what have you. The difference is eye-catching and eyeballs-on-cards is an important step leading to the goals of fingers-on-keyboard and name-in-memory. Now, changing the traditional orientation of a report page or a slide would actually be fairly disruptive in that it would both distract and impair legibility. But the same idea can be applied to a picture or short bits of text like a heading to grab attention. Our evaluation reporting tools are our business cards. Represent yourself well. The next time someone asks me how good data visualization actually contributes to a better bottom line, I’m going to retell this story. Some time ago, I sat in a meeting with 11 other people. We were reviewing evaluation findings, presented via charts, which were created by another researcher (not present). You know this scene. You’ve been there a hundred times. The group spent 20 minutes just trying to dissect a single chart. It wasn’t the data that was confusing. It wasn’t the chart type, either. But it was the little things like color and labeling that confused the 11 of us (an educated group, too, I should point out). So what did that bad design cost? So one poor chart design cost our group $273, which is actually more than the daily rate (salary and benefits) for one of the meeting attendees. Ouch. And this doesn’t include the time it took for the report author to develop the poor chart in the first place, or the time that person will put in to make the chart clearer. Bad design is expensive. Thus, investment in some professional development around good design or even consultation with an actual graphic design may literally pay off in the end. This is chartjunk, in its finest form. 1. I put the legend right in the graph. Previously, it was too far away. 2. I simplified the language. This test company was speaking test company-ese. I did this too in my first job. I worked the drive-thru (spelled like that) at McDonald’s and I asked the customer if he wanted his drink to be a “16 ounce.” He had no idea what I was talking about, of course. Let’s use language that really matters to people. 3. I added an explanation about what this test measures, right under the title. Again, make it matter to people. 4. I removed the gridlines – just chartjunk there. 5. I made the text bigger. The original version of this document wasted the bottom half of this page. Now, a page doesn’t need to be crammed with information, but trading in more readable text caters to parents. 6. I took out the target bar (why a bar?) and replaced them with actual scores. 7. I took out the months along the x axis. What’s more important is the start of the year and the end of the year. 8. I removed the “progress monitoring assessment” circles. I assume these are the interim tests conducted by the teacher. I don’t really need to know these. These seem more important for the teacher or the school to know. For a parent report, I just need to know where my kid is at each report card, compared to where he’s supposed to be. 9. 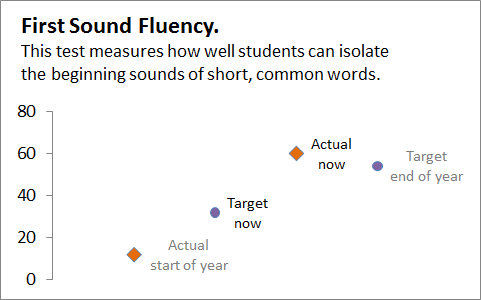 I removed the word “kindergarten” from the bottom of the x axis. I know my kid is in kindergarten. And it also says so in the information listed in the top left of the page. And under every other x axis. 10. I took out “DIBELS Next” from each y axis. Again, this is listed at the top of the page. Plus, this information doesn’t really mean anything to me as a parent. 11. 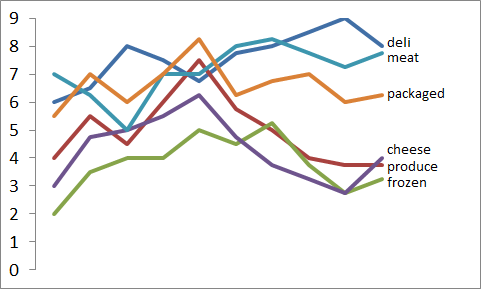 I eliminated “FSF” from the y-axis. 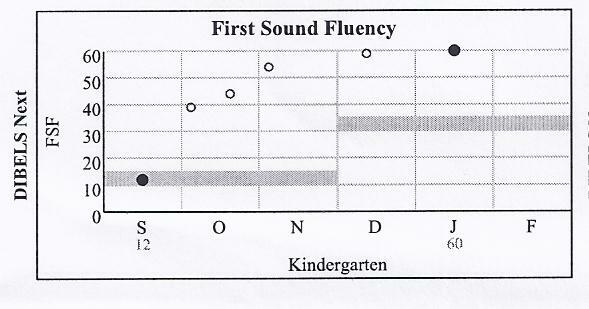 I’m confident this stands for “First Sound Fluency,” which is already labeled in the chart title. Redundancy removed. 12. I added color to each data point to more easily distinguish actual performance from the target. I also assigned them different icons. 13. I grayed out the text pertaining to the start of the year (which I saw at his first report card) and the end of the year, since those are really just reference points. So I made 13 adjustments and now I’m betting more parents would understand their child’s progress. Sure, it’s a little splashier. Sure, it involves color (but would not necessarily require it, since I also used the icons to distinguish). 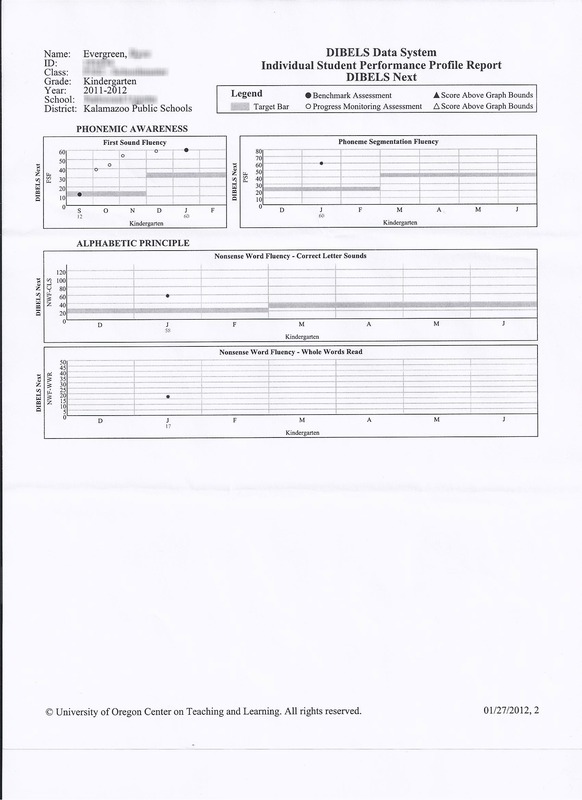 But this profile report is generated through the testing company software. It doesn’t require extra work on the part of my kid’s awesome teacher. It requires that data companies think more like their consumer, conduct some usability testing, and communicate in ways that people can understand. 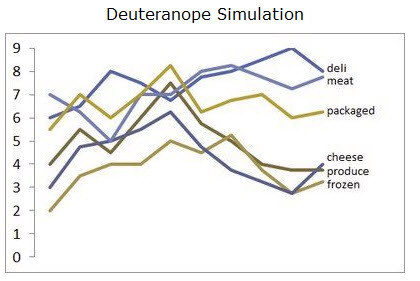 This simulated image is pretty hard to follow, isn’t it? All the better to have good legend labeling. Or highlight the most important line with one color and make the rest of them gray. You can handle it. Here I Vischecked a slide I replicated from all the others I’ve seen that make me cringe. The slide on the right shows what it would look like with red-green colorblindness (deuteranope). So don’t be afraid of color combinations – but do focus on making sure you have a light-dark pairing that will hold up no matter the projector quality, presentation laptop color settings, or audience impairment. Here’s a procedure I use all the time to help me select color combinations for my reporting. It makes use of this great, free, online program that takes all the scientific color theory stuff and translates it for those of us without a MFA. 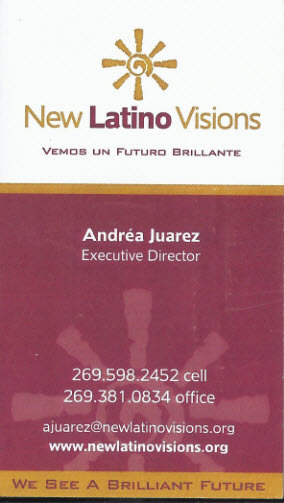 First, I head to my client’s website and take a screenshot of their logo. 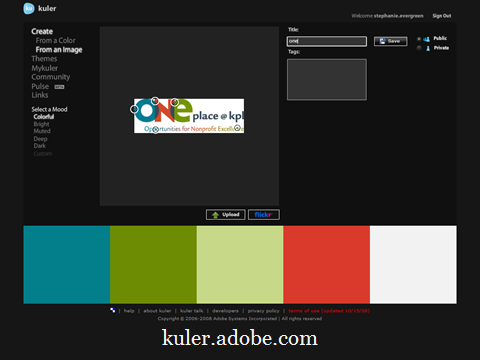 Then I go to this cool program, called Adobe Kuler (pronounced “color,” I’m pretty sure) at kuler.adobe.com. This is a color picking website. Once you sign in, you can upload your image. Here I have my client’s logo I just stole from their website. And the program picks out the exact colors from the logo. Once I save, I can click a little sliderule icon that gives me the RGB color codes. With those color code numbers, I can customize the palette of my word-processing and presentation software programs to match my colors to those of my client. I just write down those RGB color codes and head over to Word. 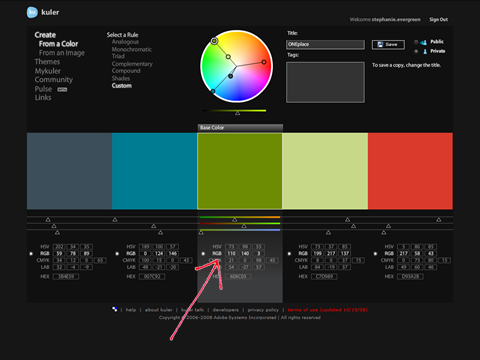 Here I’m showing a screenshot where I transferred the RGB codes from Kuler into the Custom Colors option (right-click on, say, Heading 1 in the Styles menu and select Modify, then click on the arrow by the color menu, go down to More Colors, and click on the Custom tab). In the same area you can modify the font, justification, etc. 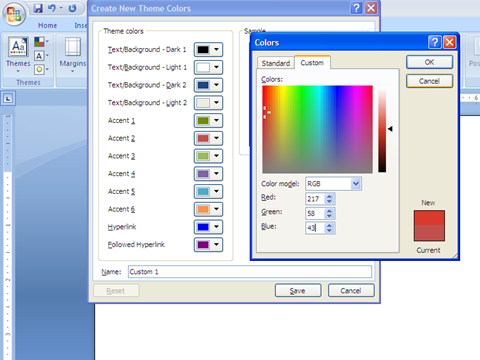 Once you have set up your page layout the way you’d like, go to the Themes button and select “Save Current Theme.” This will allow you to access to these settings on other Word documents and even in other Office programs like Excel or PowerPoint. I like to name the theme after my client and use the theme consistently in all of my work with them. Why go to all that trouble? Because now you have an intentional tone that communicates consistency and belonging with your client’s work, and that’s what evaluation should be.